A man has been arrested in Italy after he shot two police officers outside the PM’s office in Rome during new government swearing-in ceremony. One of the officers was shot in the neck and is said to be in a serious condition. 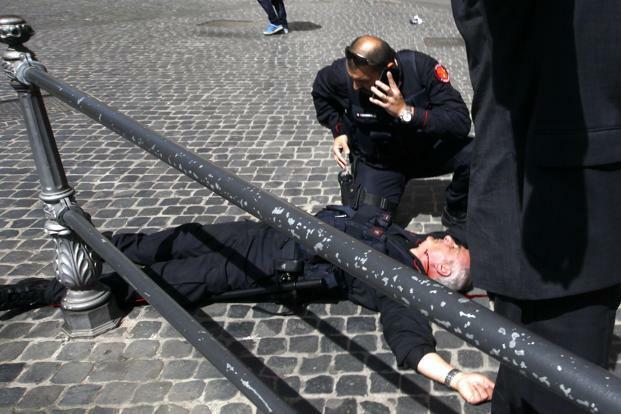 The incident was around a kilometre away from the swearing-in ceremony at the Quirinal Palace. Democratic Party Deputy Leader (PD), Enrico Letta, becomes prime minister at the head of a “grand coalition” including Silvio Berlusconi’s People of Freedom party (PDL). The swearing-in signals the end of two months of political deadlock. Correspondents say the “grand coalition” between Italy’s current main right- and left-wing parties is unprecedented, and will probably prove an uneasy alliance. Angelino Alfano, the PDL’s secretary and one of Silvio Berlusconi’s closest political allies, is deputy prime minister and interior minister in the new government. Among the other key appointments is Bank of Italy director general Fabrizio Saccomanni to head the powerful economy ministry. The cabinet is to have more women than usual, including former European Commissioner Emma Bonino as foreign minister. Other women given government jobs include Olympic kayaker Josefa Idem who becomes minister of equal opportunity and sports, and Anna Maria Cancellieri at the ministry of justice. Since February’s inconclusive poll there has been political stalemate in Italy, which is still plagued by economic woes after becoming one of the first eurozone victims of the global financial crisis of 2008. President Giorgio Napolitano said on Saturday that the government would have the support of both chambers of parliament. “I hope that this government can get to work quickly in the spirit of fervent co-operation and without any prejudice or conflict,” the president said. President Giorgio Napolitano, who is serving an unprecedented second term in Italy, has suggested he might resign if the new government fails to enact reforms.